Tsunamis, or seismic sea waves, are enormous waves that are caused by an underwater disturbance, such as an earthquake, landslide, or volcanic eruption. Tsunamis can move hundreds of miles per hour in the open ocean and then smash into land with waves that can be as high as 100 feet. Almost all tsunamis are potentially dangerous and can strike anywhere along the U.S. coastline. The most destructive ones have hit California, Oregon, Washington, Alaska, and Hawaii. Areas that are at the greatest risk for a destructive tsunami are areas that are less than 25 feet above sea level and within a mile of the shoreline. 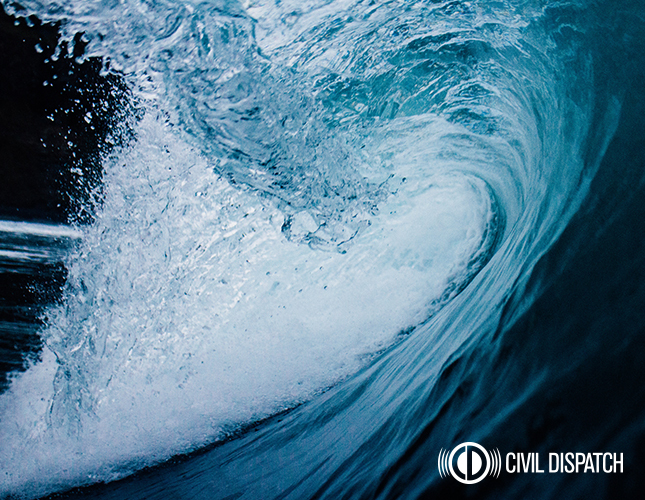 A warning is issued when a tsunami has the potential to generate imminent danger. The purpose of a warning is to alert the public that dangerous coastal flooding is very possible. Warnings can be updated, adjusted, downgraded, or canceled. An advisory is issued when a tsunami with the potential to generate strong currents and waves that can be dangerous to those that are close to the shoreline. Just like warnings, advisories can be updated, adjusted, downgraded, or canceled. A watch is issued to alert the public of an event which may later impact the watch area. Emergency management officials and the public should prepare to take action. Make a disaster supply kit and make sure your family and friends know where it is located. Inform your family about what to do when a tsunami occurs. Create and practice an effective evacuation plan. Practice during nighttime and inclement weather. Familiarity with your emergency plan can save your lives when disaster strikes. Know your children’s school evacuation plan. If it requires you to pick your children up, be aware of telephone lines during a tsunami and the routes to and from schools that may become jammed. Evacuation orders may be based on the height of your street above sea level and the distance of your street from the coastline, so it is in your best interest to know these numbers ahead of time. If you happen to be a tourist, familiarize yourself with the local evacuation protocols. If an earthquake occurs, turn on your radio to learn is there is a tsunami warning. Follow the evacuation orders that are issued by authorities and evacuate immediately. Don’t forget to take your animals with you. Move inland to higher ground as soon as possible. Pick an area that is 100 feet above sea level or go as far as two miles inland and away from the coastline. If you can’t get as high or as far away as recommended, every foot inward can make a difference. Stay far away from the beach. Never go to the beach and watch a tsunami come in. If you can see the wave then you are too close. Help neighbors that may require special assistance. This includes infants, elderly people, and individuals that have functional needs. Only return home after local officials tell you that it is safe to do so. Tsunami waves can continue for hours, so do not assume that after one wave the danger is over. Go to a designated shelter if you have been told to evacuate the area or if you feel unsafe in your home. Text SHELTER + your zip code to 43362 to find the nearest shelter in your area. Avoid disaster areas. You could be interfering with emergency response operations. Check yourself for injuries and get first aid as needed before helping injured persons. Continue using an NOAA Weather Radio or tuning to a Coast Guard station or a local radio station for updates. If you haven’t already, sign up for text messages from Civil Dispatch. These weather notifications will give you up-to-date information on weather and threats in your area.